reciting a short prayer, ending the day's fasting period by sharing a meal with family and friends." For as long as I can remember, Ramadan has always been a special time for Malaysians. For the Muslims, it is a month of reflection, religious observance and serenity as well as an opportunity to show reverent gratitude for their life blessings. By dutifully fasting from sunrise to sunset for 30 days, a sense of empathy towards the less fortunate grows within the believer, encouraging him or her to be more giving - be it in deed or in kind. 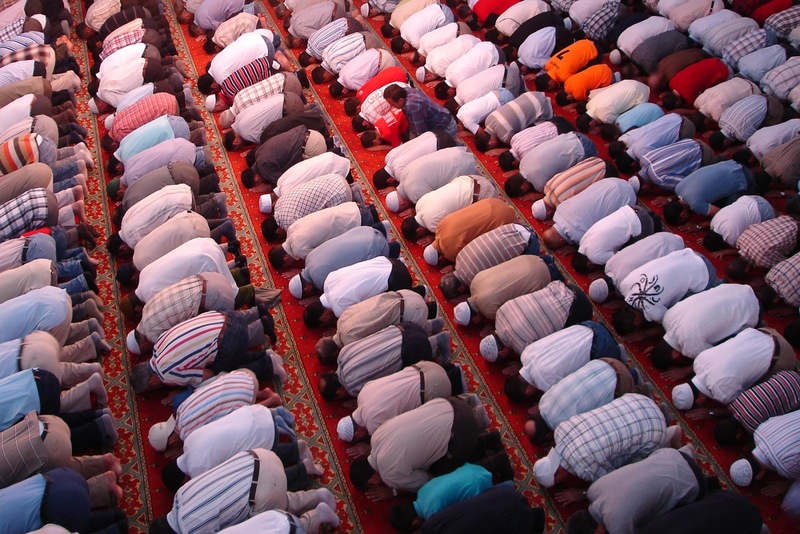 For the rest of us from other faiths, there's that inevitable eager anticipation that comes with each Ramadan of the nationally-observed Eid al-Fitr celebration which marks the end of the holy month. This is when we visit our Muslim friends' homes to celebrate with them the joy of the occasion and to reinforce our bonds of friendship - and, of course, to feast (oftentimes with near-vengeance). Visiting Malaysia during Ramadan can be - and is - a unique experience in itself as one will get to experience first-hand the sights and sounds of the country which he/she otherwise would not. While Muslims in the country take the opportunity to strengthen their faith during this holy month, the spirit of Ramadan extends its uniqueness to everyone in multicultural Malaysia - locals and visitors alike. Come with me as I show you why Ramadan is a particularly good time to visit my homeland. 1. Experience the spirit of sharing. A few hours before sunset each day when Muslims break fast, mosques throughout the country become hives of activity as volunteers, in the spirit of giving, get busy preparing light meals which are later distributed to the community as well as to passers-by regardless of race or creed. In short, everyone is welcome. Queues start to form as early as 4.30pm and the distribution of food to the public takes place shortly before sundown. To be honest, it's not really about the food as they are rather simple affairs, but more about the spirit of giving to and sharing with the community in observance of the teachings of the faith. There is a feeling of camaraderie as everyone sits together to share a meal and enjoy each other's company. I wholeheartedly encourage you partake as a visitor in one of these get-togethers; you will be welcome. Do, however, come in good faith, dress appropriately and observe several simple etiquettes with regards visiting mosques. 2. The Ramadan Bazaar. 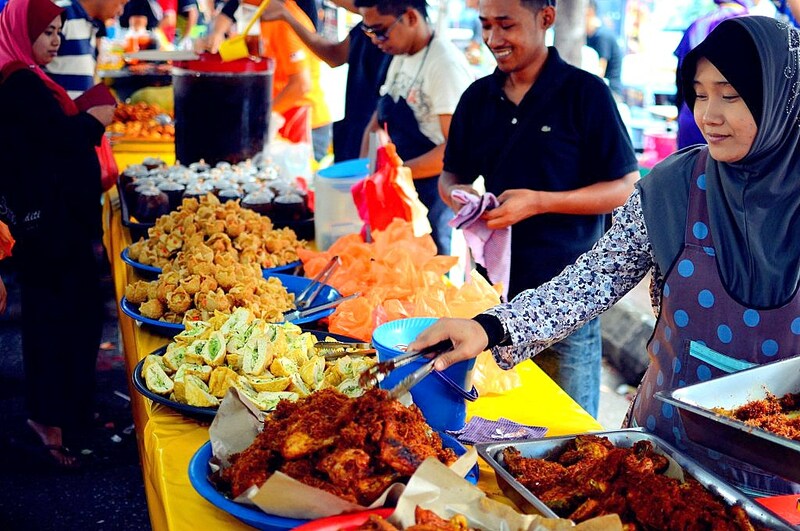 Malaysians love to eat; we hence look forward to the holy month as it is also a time when we can enjoy wonderful traditional, inexpensive delicacies sold at local Ramadan bazaars. These bazaars - with street hawkers lining stretches of roads in most residential areas - sprout around the country each afternoon during Ramadan and are extremely popular among Malaysians from all walks of life. Visiting them truly is like taking a culinary walk through Malaysia with all kinds of sights and scents greeting you as you slowly make your way from one stall to another. With the various types of food on display and the colourful characters of both hawkers as well as customers, shutterbugs will no doubt have a field day at these bazaars. 3. Preparing for Eid al-Fitr. Towards the tail-end of Ramadan, shopping malls around the country are beautifully-decorated as they're swamped by people shopping for new clothes and household items in anticipation of Eid al-Fitr. The shopaholics among you will be happy to know that this is also the best time for bargain-hunting as retailers tend to lower their prices to rid themselves of excess items before the Eid. As the curtains come down on yet another Ramadan, the month of Syawal (or shawal) is ushered in and you'll find many Muslim homes ornately-decorated with colourful lights (or in some cases, oil lamps) as well as decorative bibs and bobs. It is also during this period that most Muslims make their way to their hometowns in the uniquely-Malaysian spirit of balik kampung (literally, "returning to the village") to spend the festive period with family and friends, bringing with them the greatest message of Ramadan, that is patience and humility. Indeed, Ramadan is (and always will be) a special time for all Malaysians regardless of race, creed or standing. Ours is a multicultural society, and we joyously celebrate every festival observed by all our compatriots. It's called Respect and that's what holds the multiracial people of this nation together as one. If you plan to visit Malaysia, really anytime is a good time to do so but coming by during Ramadan definitely has its advantages which I've just mentioned. The sights, scents and sounds found in my country truly come alive during this time; so start planning. Ramadan 2016 will run from June 7 to July 6, the latter being the first day of Syawal. Welcome to Malaysia and have a blessed Eid al-Fitr 2015, everyone. Have you visited Malaysia before? If so, how did you find my country? If not, has this post inspired you to visit (especially during Ramadan)? Hello, Kally. Thank you for your kind words. Are you a blogger yourself? Thank you for sharing this post really great and wonderful article. You are talking about Malaysia which are really well-written.